Working out as I travel has always been an issue — for some reason I just really don’t like using hotel gyms and prefer to do more active work outs like spin classes and boot camps — so when I travel, I try to do active things along the way, whether it’s hiking or trying out local activities. 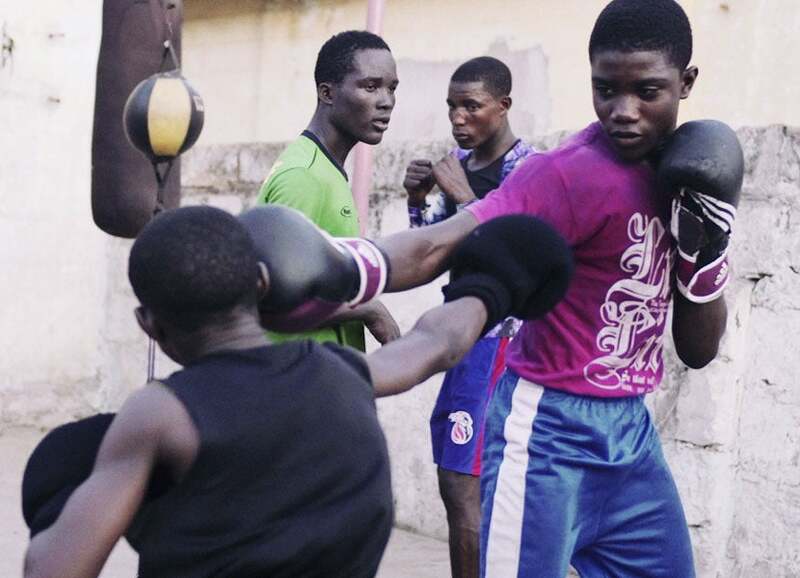 In Ghana, boxing is very, very popular — in fact, a lot of the top boxers in the world come from the Bukom neighborhood of Accra. I decided to go check out one the local boxing academies so we could get in on the action and watch them train — it just so happened that there was no boxing match that night, so I got the chance to put on the gloves and experience boxing training for myself. It was extremely hot in Accra, so I knew I was going to burn some calories and work off some of the delicious Ghanaian food I had been enjoying on my trip there. To see how it went, check out Episode 4, below. Training with Francis — aka “Black Tiger” — was awesome! After stretching out, he showed me the right way to throw a punch and we practiced sparring for a bit. Boxing is really a lot like dancing — there’s a ton of coordination involved and you really don’t get better at it unless you just keep doing it and doing it. After about 25 minutes of teaching me how to spar, I joined the group in what was basically Ghanaian bootcamp with plenty of jumping jacks, squats and the craziest part, spinning and spinning in circles until I nearly fell down. Talk about a workout! Training with Francis (aka. Black Tiger) was pretty intense but I had so much fun. I figured after such an action-packed day I deserved a break so we headed to Accra’s trendy Osu neighborhood for a night out on the town. I treated my new friends to a few rounds of drinks and used my Chase Sapphire Preferred Card to make sure I got 2x the points on dining — I love using this card because it’s accepted in lots of places since it’s a Visa, and best of all, there are never any foreign transaction fees. Alternatively, you can earn 2 ThankYou points per dollar spent on dining when you use the Citi Premier Card or the Citi Prestige Card — the Premier Rewards Gold Card from American Express also offers 2x the points when you dine at US restaurants. Stay tuned for the next episode of TPGtv where I head to Rwanda and check off a major bucket list item, trekking in the jungle with gorillas.